The existence of several anatomical variations in the root canal system may contribute to failure of the root canal therapy. The planning and performing of endodontic therapy requires knowledge of the internal dental morphology. This paper reports the case of a left mandibular third molar that presented with five root canals; a case of unusual root canal morphology so as to demonstrate the anatomic variations in mandibular third molars. Root canal therapy and case management are described. This report highlights the importance of looking for additional roots and root canals so as to enable clinicians to treat a case successfully, which might have ended in failure. Till date there is no literature documented for presence of four rooted mandibular third molar with two distal and two mesial roots having five canals. The purpose of this article was to report the successful treatment of a case of rare anatomical variant of mandibular third molar. A 43-year-old male patient came to the dental office for endodontic treatment of the left mandibular third molar (#38), with history of pain. In the dental history, episodes of spontaneous pain were found since last three days. On examination the tooth showed a restoration on the occlusal surface. The tooth was painful to percussion and showed delayed response to cold test. The preoperative diagnostic radiograph of the left third molar revealed a restoration approaching the pulp with signs of periapical radiolucency with respect to two roots [Figure 1]. The clinical diagnosis of irreversible pulpitis with apical periodontitis was made and endodontic treatment was scheduled. The restoration was removed and access was gained to the pulp chamber after administration of local anesthesia (2% Lignocaine with 1:100000 epinephrine), under rubber dam isolation. To gain sufficient access to the canals, the conventional access opening was modified into one that was wider. After careful inspection and examination under a surgical operating microscope (Global, India), it revealed the presence of five canal orifices and patency was ascertained using a small size K-file (Kerr, Orange, California). Five root canals: mesiobuccal (MB), middle mesial (MM), mesiolingual (ML), distobuccal (DB) and distolingual (DL) were identified [Figure 2]. 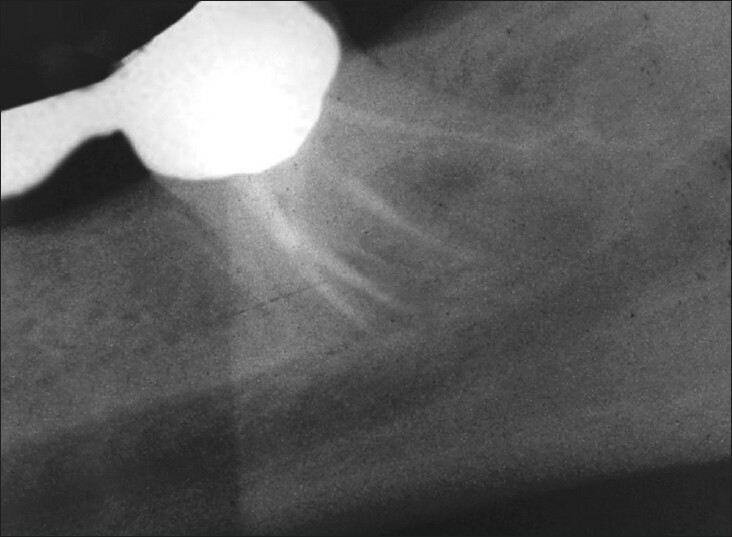 The caries was removed from the coronal walls and the working length was established with the use of apex locator (Root ZX, J. Morita Inc.) Then the working length radiograph was taken and measured [Figure 3]. The canals were cleaned and shaped with hand K-files and nickel titanium rotary Pro Taper files (Dentsply Maillefer, Switzerland). The canals were sequentially irrigated using 5.25% Sodium hypochlorite and 17% EDTA during the cleaning and shaping procedure. The canals were thoroughly dried and obturation was done using F2 Pro Taper Gutta-percha and AH Plus sealer (Dentsply, Maillefer, Switzerland) [Figure 4]. The post-endodontic permanent restoration was completed with amalgam (DPI Alloy Fine grain silver tin dental amalgam alloy, Deepdent products, Delhi, India). The patient came after a month for follow-up and was found to be asymptomatic. He was advised to get a fixed prosthesis for #38 and the remaining missing teeth. 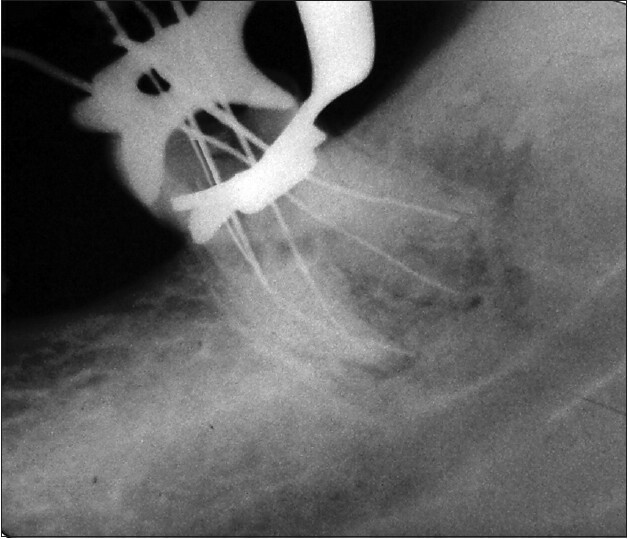 A 1-year recall radiograph showed satisfactory healing [Figure 5]. This case report points out the importance of keeping a third molar with a complete endodontic treatment. Third molars are often extracted, but if they are well-positioned in the arch, the maintenance of a third molar in function might be of some importance as distal abutment for a future prosthetic restoration and serve as potentially reliable candidates for auto-transplantation, thereby increasing the scope for retention of third molars. Although now-a-days third molars are not root canal treated anymore or used as an abutment for bridge due to use of implant to replace missing teeth,  it was done in this case as the patient could not afford implant due to limited finances. The case reported in this article was a rare case showing 3 mesial root canals in a mandibular third molar with no prior case reported till date of having two mesial and two distal roots. The only tangible proof that the treated tooth was a mandibular third molar with two mesial and two distal roots would be after extraction examination, but the clinical image from the occlusal view, it was evident that major diameter of the third molar was the mesiodistal one, as expected from anatomic consideration. 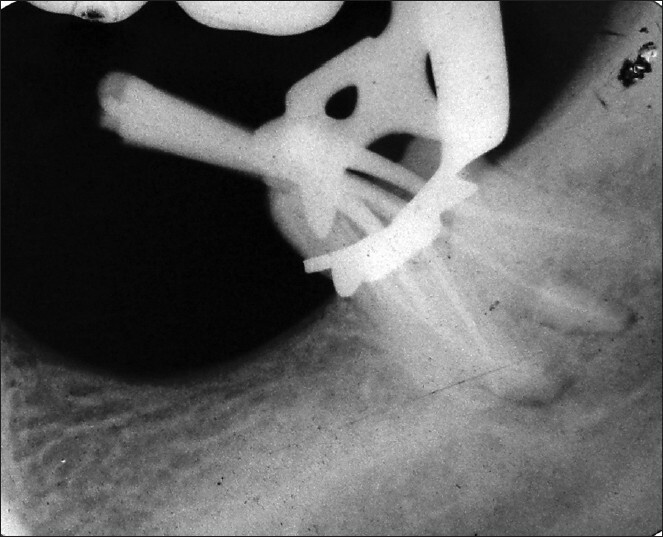 The main problem, which was faced by the operator during the procedure, was that of taking radiographs with the clamp as patient had severe gagging. So dealing with such a case not only careful interpretation of radiograph and thorough knowledge of the normal as well as anatomical variations are required but also patience plays an important role. Knowledge of biology, physiology and root canal anatomy is needed for the successful and predictable endodontic treatment outcome. The clinician should be astute enough to identify the presence of unusual numbers of roots and their morphology. Teeth with extra roots and/or canals pose a greater challenge to the dentist. A thorough knowledge of root canal anatomy and its variations, careful interpretation of the radiograph, close clinical inspection of the floor of the chamber, proper modification of access opening, patient compliance and patience on the part of the operator are essential for a successful treatment outcome and to avoid the occurrence of serious complications while commencing endodontic treatment in third mandibular molar teeth due to anatomical challenges. Mannocci F, Peru M, Sherriff M, Cook R, Pitt Ford TR. The isthmuses of the mesial root of mandibular molars: A micro-computed tomographic study. IntEndod J 2005;38:558-63. 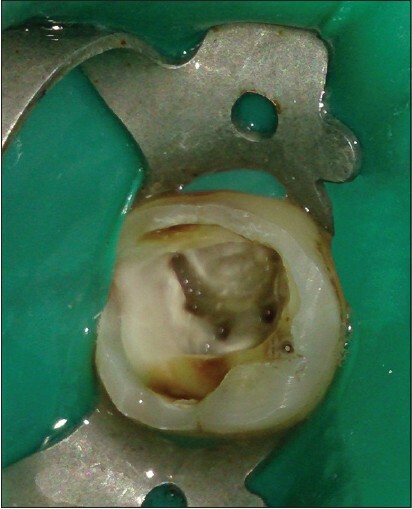 Plotino G. A Mandibular Third Molar with Three Mesial Roots: A Case Report. JEndod2008;34:224-6. Weine FS. The C-shaped mandibular second molar: Incidence and other considerations. J Endod 1998;24:372-5. Gulabivala K, Aung TH, Alavi A, Ng YL. Root and canal morphology of Burmese mandibular molars. IntEndod J 2001;34:359-70. Aly Ahmed HM. Management of third molar teeth from an endodontic perspective. Eur J Gen Dent 2012;1:148-60. CoutinhoFilho T, La Cerda RS, GurgelFilho ED, de Deus GA, Magalhães KM. The influence of the Surgical Operating Microscope in locating the mesiolingual canal orifice: A laboratory analysis. Braz Oral Res 2006;20:59-63. Carr GB. Microscopes in endodontics. J Calif Dent Assoc 1992;20:55-61. La SH, Jung DH, Kim EC, Min KS. Identification of independent middle mesial canal in mandibular first molar using cone-beam computed tomography imaging. J Endod2010;36:542-5. Cotton TP, Geisler TM, Holden DT, Schwartz SA, Schindler WG. Endodontic application of cone-bean volumetric tomography. J Endod 2007;33:1121-32. 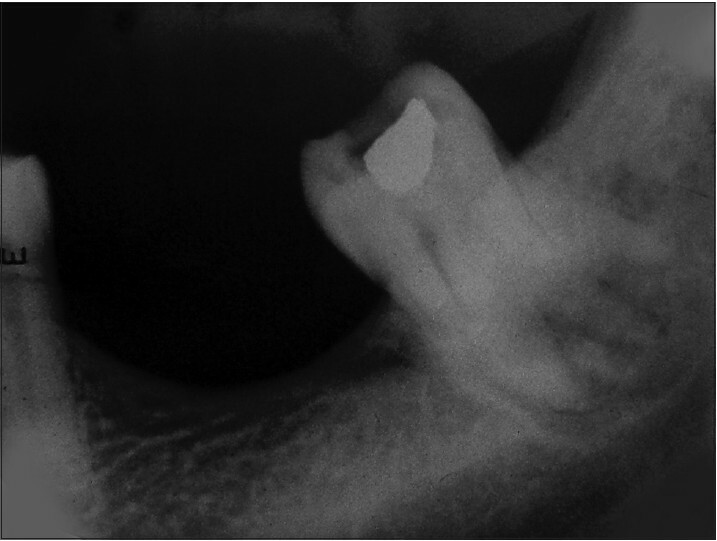 Matherne RP, Angelopoulos C, Kulild JC, Tira D. Use of cone-beam computed tomog-raphy to identify root canal systems in vitro. J Endod 2008;34:87-9. Gulabivala K, Opasanon A, Ng YL, Alavi A. Root and canal morphology of Thai mandibular molars. IntEndod J 2002;35:56-62. Guerisoli DM, de Souza RA, de Sousa Neto MD, Silva RG, Pécora JD. External and internal anatomy of third molars. Braz Dent J 1998;9:91-4.